Car es-tu reine, ô toi! la première ou dernière? C’est la mort — ou la morte… O délice! ô tourment! La rose qu’elle tient, c’est la Rose trémière. As-tu trouvé ta croix dans le désert des cieux? — La sainte de l’abîme est plus sainte à mes yeux! For are you queen, O you, the first or the last? She is death – or the dead one…O joy! O torment! The rose she holds is the Rose trémiere [hollyhock]. Have you found your cross in the desert of heaven? — She, the saint of the pit, is holier to my eyes! 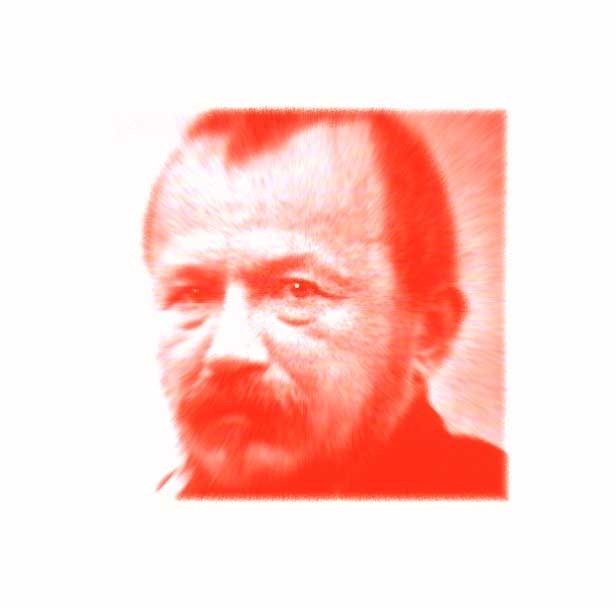 Gérard de Nerval stopped living in the winter of 1855, hanging himself with an apron string in an alley near the Rue de la Vielle-Lanterne in Paris. He was an eccentric, famously known to keep a pet lobster on a blue ribbon—because the lobster knew the secrets of the sea. De Nerval was a man of letters, he was defeated in love and he was a mad-man, occasionally to be found at night wandering throughout the Paris streets naked. His many romantic failures haunted his art. Nerval’s literary work was of the finest quality, early on he was praised by none other than Johann Wolfgang von Goethe for his exceptional French translation of Faust. Although he was unusual, he avoided the glare of the spotlight, to be forever known by his darknesses, his melancholias, and his delphic evocations into dreamlike states of mind. The small collection of sonnets (where our Artemis is found) is titled: “Les Chimères,”these chimerical monsters guide us into his world of myth. His world is not made of a single chimera; rather it’s inhabited by several chimeras. 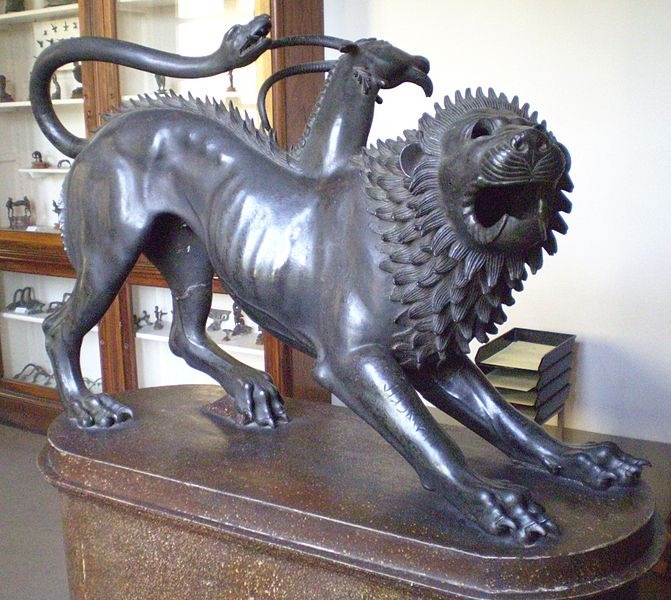 The Chimera is a composite creature with the head and body of a lioness coupled with another head of a goat and the creature is completed with a tail of a venomous snake. A chimerical vision is one of fantasy, an illusory vision. Each of de Nerval’s sonnets is its own chimera. Specifically addressing this group of poems de Nerval is quoted as saying: “They are hardly more obscure than Hegel’s metaphysics or Swedenborg’s Memorabilia; and would lose their spell by being explained, if such a thing were possible.” This is an official foreboding to venture further. But as the English critic Arthur Symons (1865 – 1945) wrote in 1899 of de Nerval’s work: “Truth, and especially that soul of truth which is poetry, may be reached by many roads; and a road is not necessarily misleading because it is dangerous or forbidden.” De Nerval, as we learn from Symons, is classified as a French Symbolist, albeit an early forefather of the later fin de siècle artistic epoch. De Nerval is equally comparable to such mystical figures as Félicien Rops (1833 – 1898), Joséphin Péladan (1858 – 1918) and Fernand Khnopff (1858 – 1921)—to name only a few. If we are to surmise anything from this stylistic classification as a Symbolist, we can speak of it as an insistence on the interiority of vision, of indulgent dreamlike spaces, and a plethora of symbolic meanings. All of this was set into motion by de Nerval through the venue of vast literary expression. His art was an objectification of the inner world of the mind. For him this was an usually haunted vision replete with symbolic value. In the example of Artemis we find in the mythic title of the Greek virgin goddess Artemis, the virgin huntress of a myth. One could only dream of understanding the language flowers as de Nerval repeats his many symbolic guises for roses. His saints, love and death’s tenderness are complex riddles too, with no easy equivalence. We’ll look into a couple of these symbols later. Meanwhile, since we are warned early on by de Nerval that the difficulty of “Les Chimères,”is to be on par with the philosopher G.W.F. Hegel (1770 – 1831) and the genius-mystic Emanuel Swedenborg (1688 – 1772), we are either put off, or piqued. This admonition, if we choose to venture further, is a wry suggestion to compare the work of the two thinkers to de Nerval’s (possible) intent with the sonnets. When we turn to Hegel, we find clues. Probably the clearest one has to do with idealism itself. Hegel was idealistic, as much as he spoke of the way idealism worked for the mind to know and to conceptualize an objective idea of the world via the spirit (the absolute spirit and the absolute idea). Even when, in the legendary preface to The Phenomenology of Spirit, where Hegel speaks of death, it is a way that death is understood intrinsically for the mind (spirit/der geist) to know itself. We know that for Hegel all of this is dialectically tending toward reason, from there we draw the line to distinguish de Nerval’s way as markedly unsystematic and irrational. Yes, de Nerval writes of death to know death, but he does so un-dialectically, as his is not a resolution, or an absolute reconciliation with death’s rational possibilities for life. In a way de Nerval’s evocation of death happens beforeHegel’s aufheben (sublation). Then, our plainest and most general connection with Hegel and de Nerval is within their mutual idealism, their mutual way of looking into the interior landscape of consciousness to grapple with a way to know the external world. Also, it is worth noting, that de Nerval and Hegel each share in their breathtaking obscurity. The philosophical work of metaphysics is the work of the mind to know being, and to know being against the nothingness of death—therein lies the pursuit of a lifelong mystery for consciousness. …and what about Swedenborg? The ‘Memorabilia’ to which de Nerval refers has to be in reference to the extensive later spiritual work of Swedenborg’s. This book is known also as his “Spiritual Diary” and is essentially a record of Swedenborg’s spiritual journeys. It is in these non-scientific works of Swedenborg’s where he documents his conversations with spiritual entities. All of this exaltation takes place on the outskirts of reality. Like de Nerval, Swedenborg was a man of detailed visions, madness and mind-numbing erudition. The very mention of Swedenborg attests again to the mystical qualities of de Nerval’s work as it contributes to our view that “Les Chimères” is a soul-searching journey inhabited by spirits, saints, monsters and phantoms etc. While we become weary to shovel ourselves deeper into the depths of mystery to conjur ‘meaning’ from our Artemis, we’ve also become buried in its very depths. It has been suggested that the opening stanza refers to a symbolic reference to Tarot cards where the metaphoric Death card is the thirteenth card, whereby de Nerval moves to the Queen card, the Lover and then to the King cards. 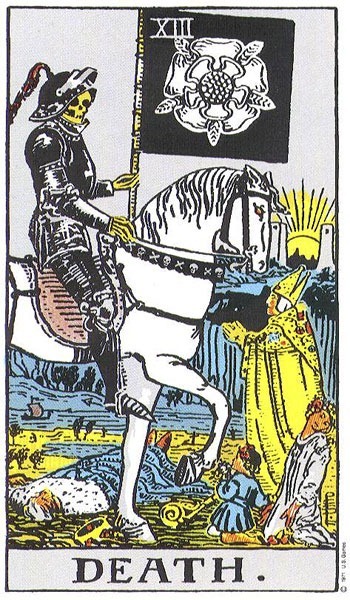 It’s uncanny to notice that on some well known Tarot decks Death is shown as the armored reaper on horseback carrying a black flag with an emblem of the white rose (a white rose mentioned briefly in the last stanza of Artemis). In the sonnet the fortune-telling cards usher us away into the domain of love (that loves de Nerval, the narrator) and her appellation is death. For de Nerval, apart from the card’s symbology, Death carries the hollyhock of fertility; let’s recall that the goddess Artemis symbolizes fertility too. Death’s connection to fertility is an ancient motif that carries with it the circularity of birth and death. Continuing through the symbolic visions of the poem, it is tough to find any reference to de Nerval’s ‘Neapolitan saint’ whose hands are full of fire. We’ll content ourselves with this as de Nerval’s personal emblem and one of infernal deviation. St. Gudula’s flower is bizarrely a kind of rare mushroom variety that ‘blooms’ in the month of January. Other varieties of mushroom in the Tremella family are known as “witches butter.” The potentially dismal last line of Artemis: “— La sainte de l’abîme est plus sainte à mes yeux!” is dramatic enough to let us know that this isn’t a Christian poem. L’abîme is often translated as pit or abyss. With this in mind, and in a less satanic key, we look to Swedenborg again. In his book: Rational Psychology there is a passage about the mysteries of the human body as a never-ending source of marvel, and then we find a telling quote: “Nature is an abyss, as it were, and naught remains but amazement.” Nature’s depths attract the imaginative powers of the mystic. As a uniquely malevolent evocation Artemis works on the troubled psyche to imagine the abysmal limits of art. In the same envisioning, one is inclined to give it the redemptive qualities it deserves. When we fear to look at mortality, its symbols and our own dark-night-of-soul, we are vengeful of death in the promise of heaven. This is a hellish desert in the heart of heaven while we search for the salvation of the cross, even as the intimacy of our irrational finality awaits us all. But whose god deserves the insult of roses when the sky burns? When we ask for meaning, let us be extra careful to not exclude the multivalence of that which cannot be uttered or disclosed in totality. A universe of signs only hints at the comprehensiveness of logic’s limits. Art contains a symbolic disclosure of our afflictions—these tragic epiphanies, this plaintive cry. De Nerval, Gérard: The Chimeras. Trans. Peter Jay. Redding Ridge, CT: Black Swan Books. 1984. p.9. Symons, Athur. The Symbolist Movement in Literature. New York: Dutton. 1958 (orig. pub. 1899). p. 17. See: Emanuel Swedenborg: A Continuing Vision. Eds. Robin Larson, Stephen Larson, James F. Lawrence, William Ross Wooffenden. New York: Swedenborg Foundation Inc. 1988. Burwick, Frederick. Poetic Madness and the Romantic Imagination. University Park, PA: The Pennsylvania State U. 1996. p. 250.